Oh, so hearty and filling! 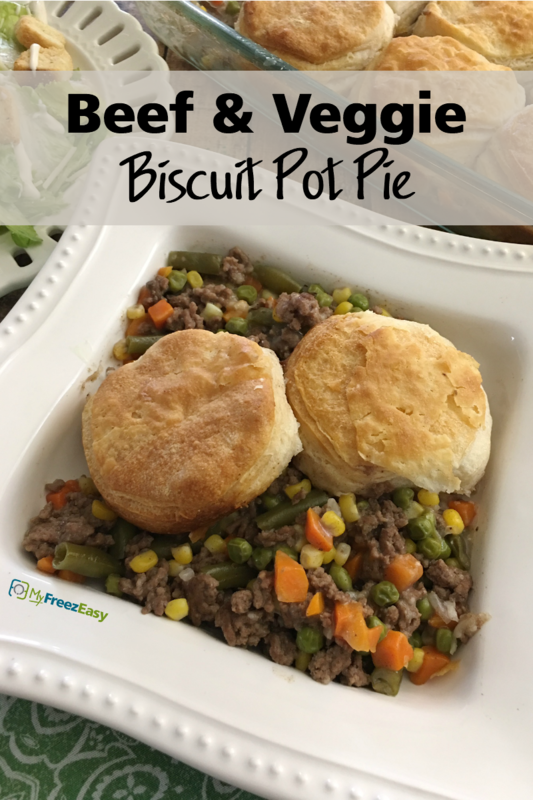 This is a great “skillet to oven” dinner – where you prep and heat the bottom layer in a skillet (in this case, browning ground beef and warming the veggies) and then you top it with biscuits and bake. In a large skillet, brown the ground beef with the minced onion and garlic powder. Once browned, drain and then stir in the cream of mushroom soup and the frozen mixed vegetables. Add the beef mixture to a 9x13 inch baking dish. Then sprinkle the Parmesan cheese on top. Bake in the preheated oven for 20 minutes, and then add the biscuits on top and bake for another 15 minutes. 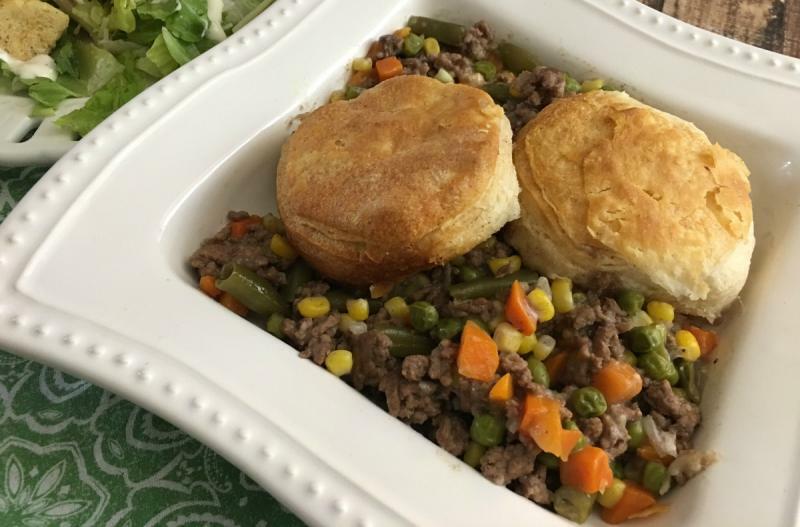 Serve Beef & Veggie Biscuit Pot Pie with salad. Brown 2 lbs. ground beef with 2 Tbsp minced onion and 2 tsp garlic powder. Drain and let cool. Open 2 cans of cream of mushroom soup. Do NOT add the biscuits before freezing. Put tray in the freezer and freeze up to 6 months in fridge freezer or 12 months in a deep freezer. Thaw in the fridge overnight, or a warm shallow dish of water for about 20 minutes, before transferring to the oven and reheating for 20 minutes. Add biscuits on top and bake for another 15 minutes. Unfortunately, there is not a great gluten-free option for this meal. Thaw completely and bake at 350 F for 20 minutes, then top with biscuits and bake another 15 minutes.